Pope John XXIII (Italian: Giovanni XXIII), born Angelo Giuseppe Roncalli (November 25, 1881 – June 3, 1963), was elected as the 261st pope of the Roman Catholic Church and monarch of Vatican City on October 28, 1958. He called the Second Vatican Council (1962-1965), known as Vatican II, although he did not live to see it to completion. He took ecumenical unity seriously. He opened the door of the Catholic Church to other religions and also to the world. Two months before his death, he completed his final encyclical, Pacem in Terris ("Peace on Earth"). He was beatified on September 3, 2000. Pope John XXIII was instrumental in opening up the Roman Catholic Church to reform by launching Vatican II and abolishing some antiquated practices. His actions were widely praised not only in the Catholic Church but throughout the world, despite the objections of small groups of traditionalists. Because of his Church renewal in this regard and also because of his vision of world peace in the universal family of humanity, he was perhaps the most important pope since the Middle Ages. Angelo Giuseppe Roncalli was born on November 25, 1881, in Sotto il Monte, a small town in the Province of Bergamo, Italy. He was the first son of Giovanni Battista Roncalli and his wife Marianna Giulia Mazzolla. The fourth in a family of 13 children, his family worked as sharecroppers. His humble roots were a striking contrast to his predecessor, Pope Pius XII, Eugenio Pacelli, who came from an ancient aristocratic family, long connected to the papacy. In 1904, Roncalli was ordained a priest in the Roman Church of Santa Maria in Monte Santo. In 1905, Giacomo Radini-Tedeschi, the new bishop of Bergamo, appointed Roncalli as his secretary. Roncalli worked for Radini-Tedeschi until the bishop's death in 1914. During this period he was also a teacher in the diocesan seminary. During World War I, Roncalli was drafted into the Royal Italian Army as a sergeant, serving in the medical corps and as a chaplain. In 1921, Pope Benedict XV appointed him as the Italian president of the Society for the Propagation of the Faith. In 1925, Pope Pius XI appointed him as Apostolic Visitor to Bulgaria, also naming him for consecration as titular bishop of Areopolis. He chose as his episcopal motto Obedientia et Pax ("Obedience and Peace"), which became his guiding motto. In 1935, he was made Apostolic Delegate to Turkey and Greece. Roncalli used this office to help the Jewish underground in saving thousands of refugees in Europe. This led some to consider him to be a Righteous Gentile. In 1944, during World War II, Pope Pius XII named him as Apostolic Nuncio to Paris, France. In the fall of 1948, while still in Paris, he aided René Cassin, the principal drafter of the Universal Declaration of Human Rights, in drafting it, although the Vatican newspaper Osservatore Romano later attacked the declaration itself for failing to recognize the sovereignty of God. In 1953, he was named the Patriarch of Venice, and, accordingly, raised to the rank of cardinal. The 1958 conclave which elected Roncalli as pope was later surrounded by suspicion. It has been claimed that a conservative cardinal, Giuseppe Cardinal Siri, was the conclave's first choice for pope but was forced, amid threats of pogroms against Roman Catholics in the Communist Eastern Bloc, to decline the papal tiara. Although this claim has never been accepted by the Vatican, it has been supported by members of sedevacantist and conclavist groups. Pope John XXIII's personal warmth, good humor and kindness captured the world's affections in a way his predecessor, for all his great learning and personal holiness, had failed to do. While Pius XII would look slightly away and up from the camera whenever his photograph was taken, John would look directly at the camera and smile. He undertook the first official acts of a pope away from Vatican territory since 1870 on December 25, 1958, when he visited children suffering from polio at the Bambin Gesù hospital. He then went on to visit Santo Spirito Hospital. The next day he visited Rome's Regina Coeli prison, where he told the prisoners: "You could not come to me, so I came to you." These acts created a sensation, and he wrote in his diary: "… great astonishment in the Roman, Italian and international press. I was hemmed in on all sides: authorities, photographers, prisoners, wardens." Less than three months after his election as pope, John XXIII gave notice of his intention to convene an Ecumenical Council. While he expressed his intention in many messages over the next three years in formal detail, one of the best known images was of Pope John, when asked why the Council was needed, reportedly opening a window and saying, "I want to throw open the windows of the Church so that we can see out and the people can see in." The council, called the Second Vatican Council (colloquially known as Vatican II), took place from 1962-1965 with four major sessions through which sixteen documents (four constitutions, nine decrees, and three declarations) on important issues were produced. After the death of Pope John, his successor Pope Paul VI carried on John's overall vision, which was therefore reflected in these documents. From Vatican II came changes such as a comprehensively revised Christian Liturgy, a Church renewal, a stronger emphasis on ecumenism, and a new approach to the world, and they reshaped the face of Catholicism. Perhaps the most theologically profound result of Vatican II was a Church renewal. The "Dogmatic Constitution on the Church" (Lumen Gentium), which was approved in the third session in 1964, stressed the spiritual and invisible character of the Church as the sacramental sign of God's kingdom, as compared with the older view of the Church as visible, militant, monarchical, and indefectible. This Church renewal brought forth the collegiality of the bishops with the consent of the pope, the increased role of the laity for holiness, and a generalized call for all humans to belong to the Church. Even before the approval of the "Decree on Ecumenism" (Unitatis Redintegratio) in the third session, Pope John, when still alive as the prime mover of Vatican II, had already met the Most Rev. Geoffrey Francis Fisher, the Archbishop of Canterbury, for about an hour in the Vatican on December 2, 1960. It was the first time in over 400 years, since the excommunication of Elizabeth I of England, that the Archbishop of Canterbury had met with the Pope. In November 1961, history was made again when John XXIII sent official Catholic representatives to a General Assembly in New Delhi of the World Council of Churches. Needless to say, he communicated also with the Eastern Orthodox Church. His considerateness for the Jewish faith was well expressed in his directive to remove from the traditional Good Friday liturgy its reference to the "perfidious Jews." It is therefore Our earnest wish that the United Nations Organization may be able progressively to adapt its structure and methods of operation to the magnitude and nobility of its tasks. May the day be not long delayed when every human being can find in this organization an effective safeguard of his personal rights; those rights, that is, which derive directly from his dignity as a human person, and which are therefore universal, inviolable and inalienable. This is all the more desirable in that men today are taking an ever more active part in the public life of their own nations, and in doing so they are showing an increased interest in the affairs of all peoples. They are becoming more and more conscious of being living members of the universal family of mankind. It is noteworthy that in this document we are all treated with dignity as "living members of the universal family of mankind." 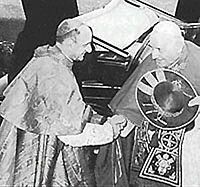 Pope John XXIII was the last pope to use full papal ceremonial, much of which was abolished subsequently after Vatican II. His papal coronation ran for the traditional five hours. Pope Paul VI opted for a shorter ceremony while later popes declined to be crowned. However, as with his predecessor Pope Pius XII, he chose to have the coronation itself take place on the balcony of Saint Peter's in view of the crowds assembled in Saint Peter's Square. Unlike other popes who tended to wear just one papal tiara, John, much to the delight of photographers, wore a number of tiaras from the papal collection. On formal occasions, such as giving the Urbi et Orbi blessing he wore the traditional 1877 Palatine tiara with which he had been crowned. However, on other occasions he wore the lighter and more comfortable 1922 tiara of Pope Pius XI, which he used so often that it became strongly associated with him. When he was given an expensive silver papal tiara by the people of Bergamo, Pope John XXIII asked the makers to halve the number of jewels with which they planned to decorate it and give the financial saving to the poor. This tiara became the lightest in the papal collection at 2 lb (900 grams). It was given to him eventually, in 1959. (None of the tiaras associated with Pope John have been worn by later popes). Pope John was also the last pope to date to have his Requiem Mass celebrated within St. Peter's Basilica, amid traditional papal pomp. His successor, Pope Paul VI abolished the traditional papal funeral and had his funeral as a simple concelebrated Mass in St. Peter's Square. Indeed, many of the rituals associated with papal ceremonies such as the flabelli (ceremonial fans made of ostrich feathers), the Palatine Guard, and the saluting of the pope on his arrival at Mass in St. Peter's Basilica by the playing of trumpets, were abolished by his successor, Pope Paul VI, in phases during his reign. Pope John XXIII was first diagnosed with stomach cancer on September 23, 1962. The diagnosis, which was kept from the public, came after nearly eight years of occasional stomach hemorrhages. These bouts with illness reduced the pontiff's appearances. Looking pale and drawn during events, he gave a hint to his ultimate fate on April 1963, when he said to visitors, "That which happens to all men perhaps will happen soon to the Pope who speaks to you today." On May 11, 1963, the Italian president Antonio Segni awarded Pope John XXIII the very prestigious Balzan Prize for his engagement for peace. It was the Pope's last public appearance. On May 25, 1963, the Pope suffered another hemorrhage and required blood transfusions, but peritonitis soon set in, resulting in his death on June 3 at the age of 81. He was buried on June 6, ending a reign of four years, seven months and six days. In 2000, he was declared "Blessed" by Pope John Paul II, the penultimate step on the road to sainthood. His being honored with Beatification, assures with certainty that he lived a life of heroic virtue, and has been proven to be extraordinarily holy. He and Pope Pius IX, were the first popes since Pope Pius X to receive this honor. Following his Beatification, his body was moved from its original burial place in the grottoes below St. Peter's Basilica, to the altar of Saint Jerome where it was displayed for the veneration of the faithful. At the time, the body was observed to be extremely well-preserved—a condition which the Church ascribes to the lack of oxygen in his sealed triple coffin rather than to any miraculous event (although it was certainly seen as such by many of the faithful). When John was moved, the original vault—which was above the floor—was removed. A new vault was built beneath the ground, and Pope John Paul II was later buried in this vault. Traditionalist Catholics criticize Vatican II for moving the Church away from the fundamental principles of its historic faith, abandoning the holiness of the Latin Mass and compromising with the world. Yet even conservative mainstream Catholics defend Vatican II, saying only that the more radical changes made or proposed by liberal churchmen over the last 40 years "in the spirit of Vatican II" are wrong. Some who subscribe to the teachings of Our Lady of Fatima criticize Pope John for allegedly withholding the third secret of prophetic information which had been revealed in 1917 by an apparition of the Virgin Mary at Fatima, Portugal, and which had been expected to be publicized in 1960 according to her instruction at that apparition. (It was not until 2000 that it was publicized by Pope John Paul II, and it was allegedly about the murder of the pope and other religious leaders.) This may be related to internet reports in the late 1990s about a supposed "lost diary" where John describes how he himself received from the Virgin Mary prophetic insights into the future, including the return of Jesus in New York in 2000. There is no evidence in his officially published diary Journal of a Soul to suggest that he received apocalyptic visions of the future. John XXIII was a man of love beyond religion, beyond nation, and beyond culture. He loved everyone, and this in turn caused everyone to love him. He has been known affectionately as "Good Pope John" and "the most loved pope in history" by many people. On December 6, 1963, President Lyndon B. Johnson posthumously awarded him the Presidential Medal of Freedom, the United States' highest civilian award, in recognition of the good relationship between Pope John and the United States. Many Protestant organizations honored him as a Christian reformer. Both Anglican and Lutheran Christian denominations commemorated John XXIII as a "renewer of the church." Even the fiercely anti-Catholic Belfast City Council in Northern Ireland flew the flag over city hall at half-staff in his honor after his death. Perhaps his humble and loving personality can be attributed to his upbringing as the son of simple Italian peasants. It is amazing that although he was originally expected to be just a short-term "stop-gap" pope as an elderly man, he turned out to be perhaps the most important pontificate since the Middle Ages because he made the Catholic Church more relevant and available to the world through Vatican II. His vision of world peace in "the universal family of mankind" under God, as expressed in his important encyclical Pacem in terris, is universally true and relevant, and it is what we are expected to realize today. From his early teens, he maintained a diary of spiritual reflections that was subsequently published as Journal of a Soul. The collection of writings charts his efforts as a young man to "grow in holiness" and continue after his election to the papacy. It remains widely read. ↑ Peter Hebblethwaite. Pope John XXIII: Shepherd of the Modern World. (Galilee Trade, 1987), 303. ↑ "Dogmatic Constitution on the Church." Retrieved June 16, 2008. ↑ "Decree on Ecumenism." Retrieved June 16, 2008. ↑ Mater et Magistra. Retrieved June 4, 2008. ↑ Pacem in terris. Retrieved June 4, 2008. ↑ "John XXIII against Fatima," in The Catholic Counter-Reformation in the XXth Century. Retrieved April 18, 2008. ↑ "Pope John XXIII Predictions" Retrieved April 18, 2008. Martin, Malachi. The Keys of this Blood. New York, NY: Touchstone, 1991. Pope John XXIII. Journal of a Soul, Translated by Dorothy White. MacGraw-Hill, 1965. All links retrieved May 23, 2018. John Vennari, (ed) Catholic Family News. 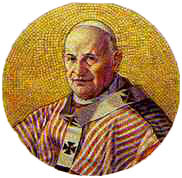 John XXIII was embalmed; Vatican denies he is subject of miracle of incorruptibility LewRockwell.com. Homily by Pope John Paul II from Pope John XXIII beatification mass Sunday, 3 September 2000, Libreria Editrice Vaticana. This page was last modified on 23 May 2018, at 16:05.